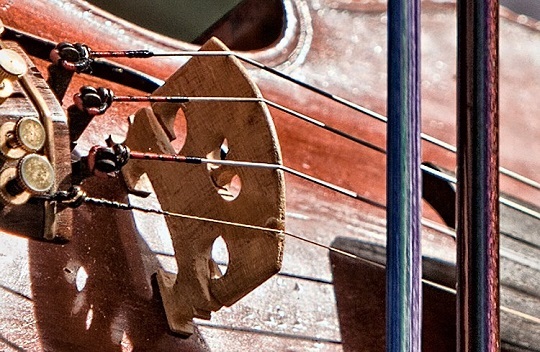 Why is it so important to keep your bow straight on your violin? Because your tone and intonation depend on it. And it’s one of the things that beginners struggle with most. In this post you’ll learn some exercises that REALLY help keep your bow straight. Work them into your practice and let me know what you think! Close your eyes, take your bow off the string, then find the same spot, bow straight with your eyes closed. Open your eyes and see how you did. This exercise really helps to speed the process of “muscle memory” in regards to straight bow. Aside from that exercise, practicing in a mirror is the surest way to stay on the “straight and narrow”, and eventually, you memorize the feel of the straight bow. As you work on straight bow, try to listen for the “sound” of a straight bow: pure and focused, compared to the sound of a crooked bow, which is flawed and fuzzy. Later in the Red Desert Violin Suzuki Book 1 class, you will learn a concept that is unique to Red Desert Violin called “good and bad bananas”. This concept has proven extremely helpful to students learning tone production and bow control. Click here to learn about my online violin lessons and to sign up.